Studio Ghibli’s films are amazing for many reasons, but one thing that always impresses me is their keen sense of the natural world. 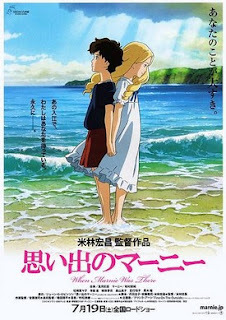 Take, for example, the opening scene of their latest offering, director Hiromasa Yonebayashi’s 2014 fantasy When Marnie Was There. In it, the lead character, Anna, is sitting in a park by herself, drawing in her sketchbook. It’s a lovely sunny day, and as her classmates (gathered nearby) are talking with one another, Anna is watching some kids play in a sandbox. The animation, of course, is beautiful, but this scene does more than simply wow us with its artistry; it brings us into its world, and in so doing makes it feel almost tangible. Like Anna, we bask in the warmth of the sun as it peeks through the trees, and enjoy the slight breeze blowing all around us. Over the years, the studio’s output has stirred our emotions, but it’s this ability to transform the artificial into reality that makes their movies stand apart from the rest. We will experience other palpable moments during When Marnie Was There: walking in a rain storm; water from a lake lapping against our ankles; and the crisp air of a moonlit night. It’s difficult enough for a live-action film to evoke such a sensation. For an animated picture to achieve it is nothing short of a miracle. During that sequence in the park, we learn quite a bit about Anna. For one, she’s an outsider, a girl who is always on her own, and seems to prefer it that way. She’s also incredibly shy; despite the fact she’s a talented artist, Anna shrinks at the thought of sharing her sketches with someone else. When a teacher asks to see what she’s doing, Anna has a panic attack, and is immediately sent home. Her foster mother Yoriko (Anna’s real parents were killed in a car accident when she was an infant) fears for her daughter’s well-being, and, at the recommendation of the family doctor (he believes the attack was brought on by asthma), sends the young girl to the country for a few months to stay with her relatives, the Oiwas. Though distant at first, Anna soon warms up to her hosts, who allow her the freedom to explore the surrounding landscape, warning her only to steer clear of the Marsh House, a rundown mansion that lies at the other end of the lake. But Anna finds herself strangely drawn to this old building, and can’t shake the feeling that she’s been there before. One night, she meets Marnie, a young girl about her own age who claims that she lives in the Marsh house with her parents and several servants. Ignoring the orders of her strict nanny, Marnie slips away each and every night to be with Anna, and the two become fast friends. But there’s more to this mystery than either of them realizes, and a handful of startling revelations expose the truth about Marnie while, at the same time, helping Anna understand her own past as well. Unlike every other Studio Ghibli film, the name “Hayao Miyazaki” doesn’t appear anywhere in the production credits for When Marnie Was There (the famed producer / director retired before this picture was made). Yet, even in his absence, the movie bears his unmistakable mark, from the style of its animation to the richness of its characters, most of which are female (actress Geena Davis, who provided the voice of Anna’s mother in the English dubbed version, said in an interview that “if you ever wanna show someone an example of what you can do with female characters and the kind of range you can portray, just look at the films of Studio Ghibli”). As they’ve done many times before, in pictures such as Princess Mononoke, Spirited Away, The Tale of Princess Kaguya and a slew of others, the artisans at Studio Ghibli throw a spotlight on some fascinating young women in When Marnie Was There, from the introverted Anna, who refuses to realize how special she truly is, to the effervescent Marnie, who shows her new friend that life is definitely worth living. Even the supporting characters, like Nobuko, a popular girl who tries to befriend Anna when she first arrives in the country, and Setsu Oiwa, the kindly caretaker who gives Anna the freedom to do what she wants, are multi-layered individuals, and as alive as they can possibly be. Based on author Joan G. Robinson’s 1967 novel of the same name, When Marnie Was There is a much darker story than most told by Studio Ghibli (Anna’s depression, which occasionally crosses into self-loathing, dominates the first half of the film), but that doesn’t prevent it from becoming a life-affirming experience. Even without Hayao Miyazaki at the helm, Studio Ghibli continues to set the bar higher with each new production, showing the world what animation can accomplish with a little imagination and a whole lot of heart.